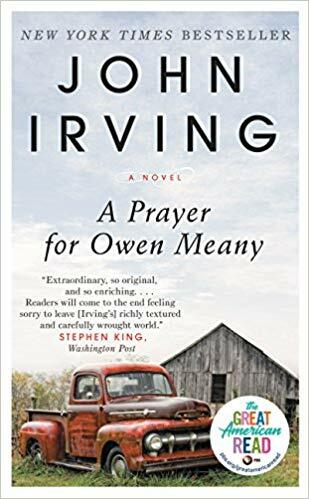 My favourite book is A Prayer for Owen Meany. It’s really funny. It is one of those books that can’t be read in bed because your unsuccessfully-stifled laughter will make it impossible for your spouse to sleep. It offers the full range of humour, from ridiculous situations through extraordinary characters to profound ironies. And the more times you read it, the funnier it gets. I also like it because it is very well-crafted. It’s full of the things that students of literature get excited about: comparison and contrast, patterns and parallels, foil characters and motifs. It’s filled with symbolism, irony, and juxtaposition. It doesn’t just make you think about literature stuff, though. It also makes you think about life which is what great art always does. This novel is about doubt, but mostly about belief in God. The novel opens with “I am a Christian because of Owen Meany” (1). This is an important book because it is exploration of faith. Specifically, it reveals some very important things about faith in a modern context. By modern, I don’t mean that we have smartphones and smart cars. To be Modern means we have a certain way of looking at the world, the other and ourselves. The novel doesn’t just reveal the difficulty of faith in the modern world, but the nature of that faith. The influence of Modernism can easily produce an anemic faith. As you read the novel, you will see this limited faith held by the adult narrator of the story. This all sounds rather serious, and it is, but, don’t forgot–this book is the funniest and most entertaining book I’ve ever read. I invite you go get yourself a copy of A Prayer for Owen Meany, and read it with me. I’ve written a post for each chapter commenting on how the novel might be useful to help us understand our own struggle with faith in our world today. Be sure to read the three epigraphs that precede the narrative. These little gems help us focus on the key ideas in the novel. The first epigraph emphasizes the nearness of God; he’s close enough we can talk to him and ask things of him. It also suggests that awareness of God’s presence alleviates our anxiety. Buechner points out that in the face of absolutely certain evidence about God’s existence, the individual believer would be annihilated. Irving takes this idea very seriously; he continuously undercuts religious certainty in the story. Or does he? As you read, attend to the connection between Christian faith and heroism.